Alisa Dworsky is an artist, architectural designer, and educator. 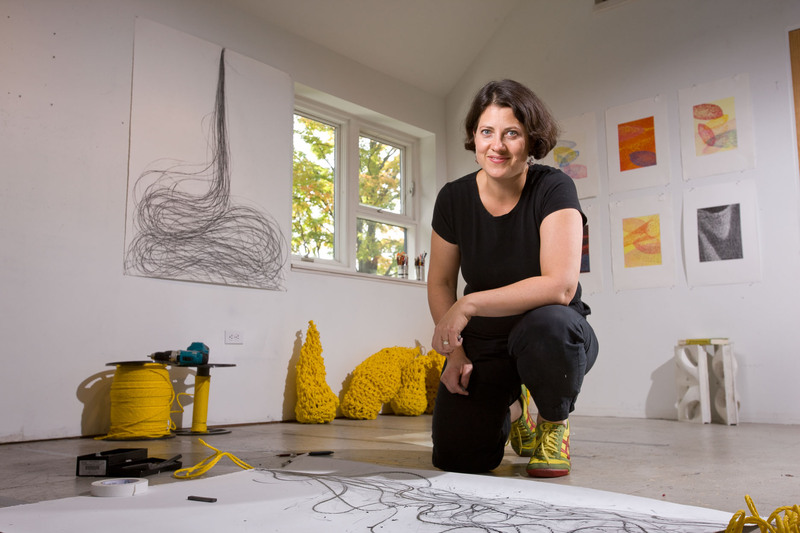 Her artwork includes sculptures of crocheted rope, intaglio prints, graphite and charcoal drawings and large-scale public installations. She is known for the way her site specific installations transform their environment through the use of texture, color and geometry as well as for her innovative approach to drawing and printmaking. Dworsky has created installations for the Lexington Art League in Lexington KY, 516 Arts in Albuquerque NM, the Bennington Museum in Vermont, the BCA ( Burlington City Arts) Center in Vermont , Cynthia Reeves projects in Newport NH, the Burlington waterfront, the Fleming Museum at the University of Vermont, the Brattleboro Museum in Brattleboro Vermont and a mile long highway installation with the Vermont Agency of Transportation. Her latest installation “Drawn Out” and her drawings are in the exhibit “Flat/Not Flat” at Artspace in New Haven until January 25th, 2014. Recent exhibits include “Arcadia Now” at New Jersey City University in 2012 and solo shows at the BCA Center in Burlington and Catherine Dianich Gallery in Brattleboro in 2011. Her work has been published in Public Art Review, Art New England, New England Home and the New York Times. Dworsky received a B.A. with majors in Studio Art and in International Relations from Stanford University and a Masters Degree in Architecture from Yale University. She has taught architecture and art at Norwich University, Stanford University, The Yale Graduate School of Architecture, Ball State University and the Yestermorrow Design-Build School and lectured widely on her architecture and art. She is Co-founder of Terra Firma Inc., an architectural design company that focuses on ecological design. She lives in Montpelier Vermont with her husband and design partner, Danny Sagan, and their two daughters. For more information on her and her work visit her website http://www.alisadworsky.com or click “Alisa Dworsky-portfolio” on the Blogroll at right of this page to reach her site.